Those looking for incredible things to do in Prince Edward County are in for one heck of a ride. This picturesque island near Belleville, Ontario is less than a 3-hour drive from Toronto, but Prince Edward County is a world away from the big city. Whether you are looking for great Prince Edward County things to do such as relaxing on the beaches of Lake Ontario’s sparkling blue waters, sampling wine at some of the province’s most spectacular vineyards, or exploring one of the most relaxed and beautiful regions in Ontario. Prince Edward County Canada is one of Ontario’s most incredible destinations. It offers a similar experience to the Niagara wine region, but at a much more relaxed pace. And yet, with the miles of incredible beaches, there is an angle to visiting Prince Edward County that can’t be replicated anywhere in the province. 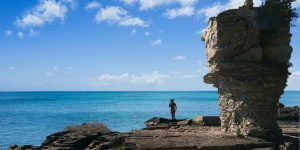 “PEC”, as Prince Edward County is often referred to by those outside, or “the County”, as it’s referred to locally, is one of Ontario’s prime travel destinations, and with all of these things to do in Prince Edward County, you’re sure to understand why. PEC is one of our favorite travel destinations in Ontario. It’s a destination that Christina and I would visit long before we had children. And since our family has grown, we’ve come back to Prince Edward County with kids many times to share the beauty of this Lake Ontario attraction with them. So whether you are traveling by yourself, as a couple, or as a family, know that there are Prince Edward County attractions for everyone. 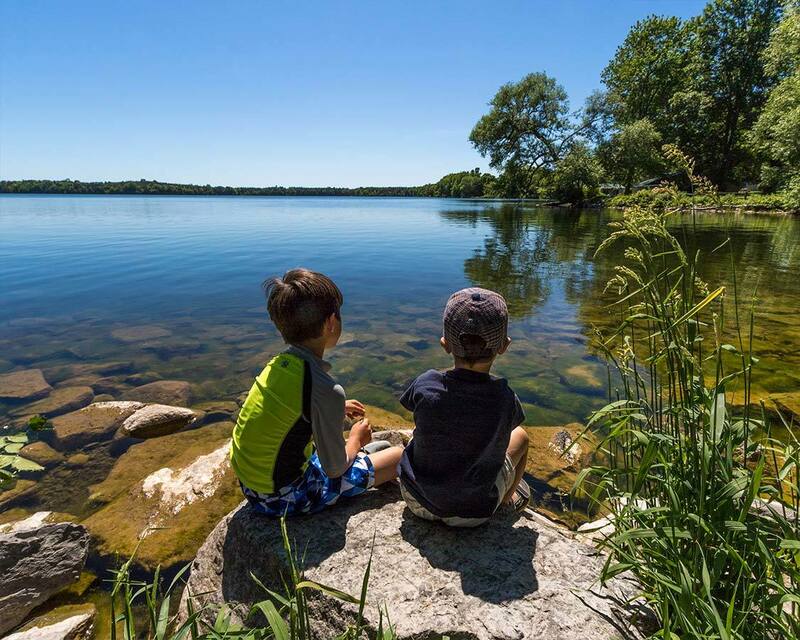 Should You Visit Prince Edward County With Kids? Prince Edward County Canada is a large island jutting into the blue waters of Lake Ontario. It covers much of the area between the towns of Brighton and Kingston. Prince Edward County is a popular stop on road trips between Toronto and Ottawa and Montreal. The PEC island is actually very large, so if you’re looking at doing a day trip to Prince Edward County, you’ll need to limit yourself to one or two towns. But, if you are looking at spending a weekend or a long-weekend in Prince Edward County, you can experience a good chunk of the best Prince Edward County things to do. PEC is about 2 hours and 45 minutes from Toronto it’s about the same distance from Ottawa to Prince Edward County. The main towns in Prince Edward County are Picton, Wellington, and Bloomfield. However, there are a number of small communities that make up all of Prince Edward County. You don’t have to dig deep if your searching for what to do in Prince Edward County. As soon as you cross over onto this picturesque island, it becomes obvious that this is someplace special. The landscape changes to mostly flat, grassy farmland. The cars that were once tearing recklessly down HWY 401 slow to a comfortable pace, and all around you the landscape takes on the most beautiful shades of green, yellow, and gold. 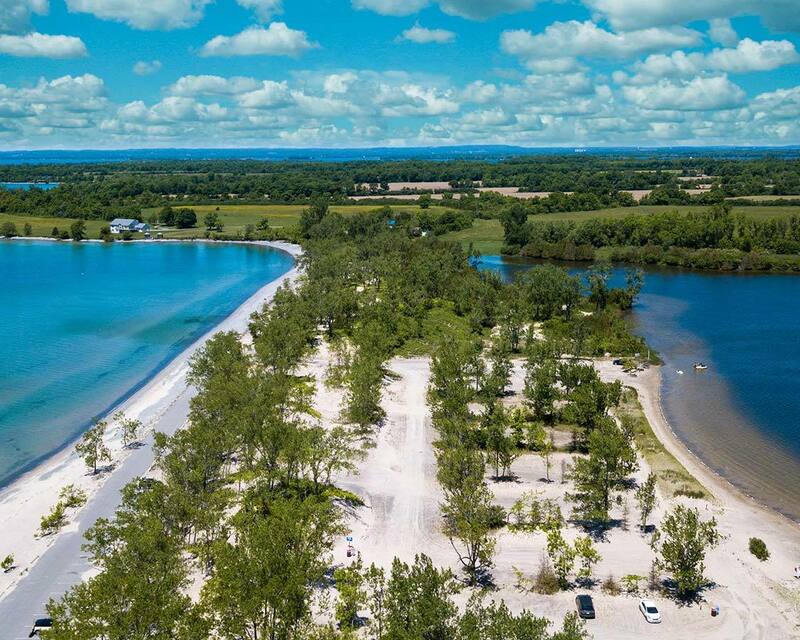 Without a doubt, Sandbanks Provincial Park is the top attraction in Prince Edward County. In fact, Sandbanks Provincial Park is one of the most popular attractions in Ontario. We love our Ontario beaches. 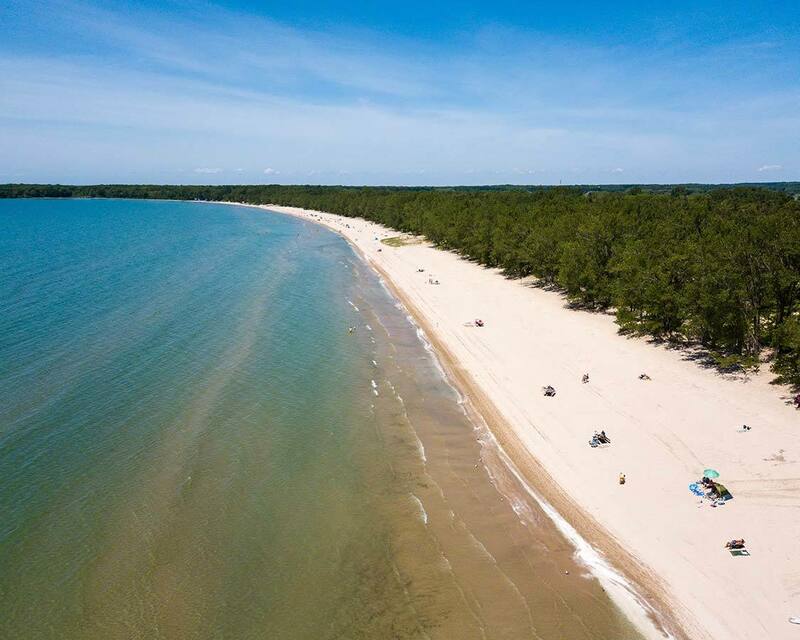 Whether we are soaking in the sun at Sauble Beach, or splashing in the shallows of Bon Echo Provincial Park, we are always looking for amazing beaches in Ontario. And Sandbanks stands out as one of the top beach destinations in Ontario. 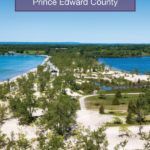 There are three beaches at Sandbanks Provincial Park. They mix golden sand with the bright blue waters of Lake Ontario. There are amazing camping sites here as well but book early because campsites at Sandbanks fill up very quickly. 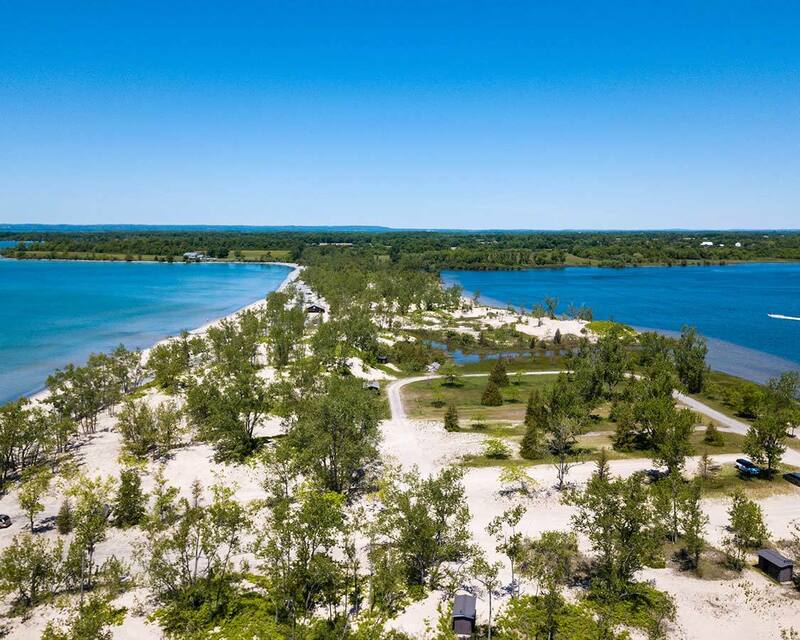 Even compared to nearby Presquile Provincial Park, Sandbanks stands out as one of the best parks in Ontario for sunbathers. The beaches here are incredible. Sandbanks is about 30 minutes from the town of Wellington in the southwest corner of Prince Edward County. If you are traveling from Picton it’s only about a 25-minute drive to Sandbanks. 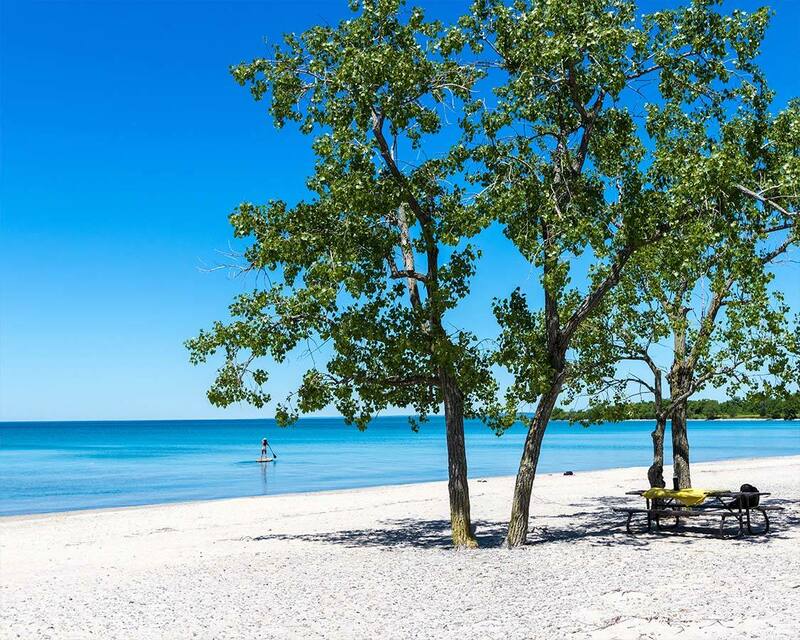 North Beach Provincial Park is one of the Prince Edward County hidden gems. To visit North Beach, a newcomer might think that they are lying somewhere in the Caribbean. This thin stretch of golden sand has the picturesque Lake Ontario on one side, and the calm waters of North Bay on the other. 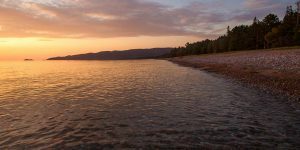 Although North Beach Provincial Park is often referred to as “Little Sandbanks” by locals, this beach offers a far different experience than it’s more famous neighbor. There are 1.2 km (.8 miles) of sandy beach perfectly dotted with shady tree’s. North Beach Provincial Park has excellent picnic areas and toilet facilities. And, there is car parking (directly on the beach) for $14.50 per car. There is an option to park outside the park and walk in for $2 per car. North Beach Provincial Park is just south of the town of Consecon and about 45-minutes northeast of Sandbanks Park. Pro-Tip: On windy days the Lake Ontario side of North Beach Provincial Park can have a dangerous undertow and large waves. The North Bay side .is much calmer but has a sharp drop-off in depth. Most of the landscape of Prince Edward County is flat. This makes biking in PEC a hugely popular activity. And there are few places better suited for biking (or walking) in Prince Edward County than the Millenium Trail (currently only the 11 km near Wellington is smooth gravel, the rest is a bit of a rougher ride). This 48-kilometer (30 mile) converted railroad line winds through the local agriculture fields, marshes and forests from Picton to Wellington. During the spring and summer, the trail is brightly colored by wildflower beds. For those who don’t want to head out on their own, the Sip and Cycle wine tour takes guests along an 18km route through the Millenium Trail that visits a few of the local Prince Edward County wineries along the way. It’s nearly impossible to look for what to do in Prince Edward County without considering all of the incredible PEC wineries. Prince Edward County is among Canada’s newest wine regions. The region has only been VQA designated since 2007, but there are now over 42 wineries in Prince Edward County. Whether you are exploring Prince Edward County with kids or with a group, the wineries of the county are wonderful for everyone. Waupoos is one of the most classic Prince Edward County wineries. 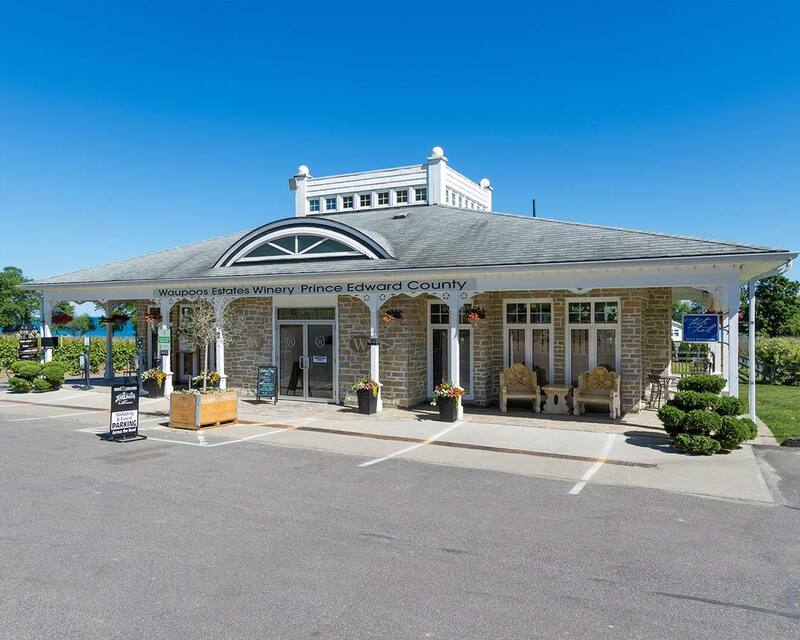 Their outdoor gazebo is one of the most popular restaurants in Prince Edward County and the Waupoos Estate tasting room has incredible views of Lake Ontario and the vineyards. Waupoos Estate Winery is located on the western arm of the County along HWY 8. The Grange of Prince Edward Winery is located just north of the town of Wellington. They have a raw, natural barn wood tasting room that gives a classic vintage feel. There is an excellent selection of wines at the Grange winery, and the ambiance makes it a perfect place for the whole family to explore. Sandbanks Estate Winery is one of the most prestigious wineries in Prince Edward County. While we often enjoying visiting smaller wineries, Sandbanks Estate is definitely worth a visit if you are looking for great things to do in Prince Edward County. They have a huge selection of wines and the grounds of Sandbanks winery are beautiful. Lake on the Mountain Prince Edward County is an unusual phenomenon. 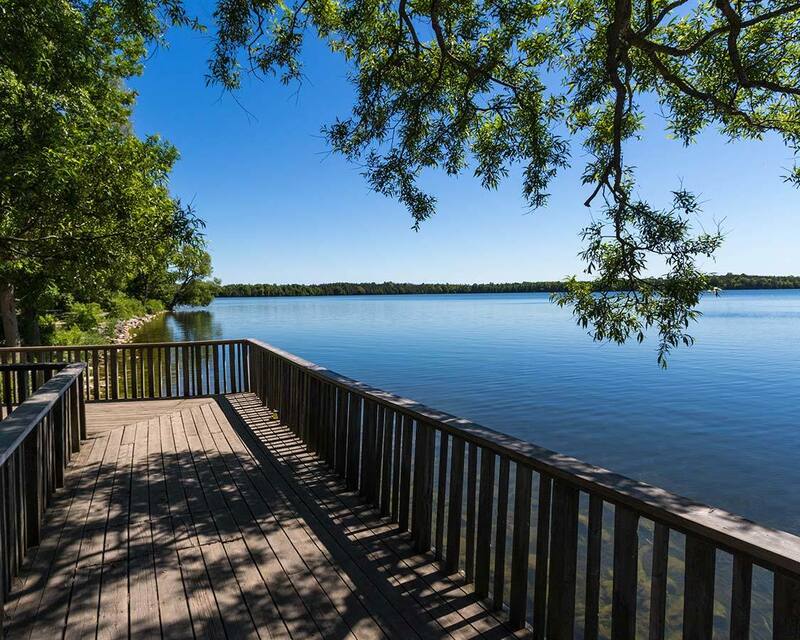 This picturesque lake sits 62 meters (203 feet) above the Bay of Quinte near the town of Picton. It has no known source of water, yet has a steady flow of clean, fresh water that eventually tumbles over the escarpment into the Bay of Quinte. There are boardwalks, picnic facilities, and more to help you enjoy the beautiful surroundings. Stop in at the Inn on the Mountain for some great food on their garden patio. You can also taste some of the local Prince Edward County craft beers here. It’s not just the wineries that make Prince Edward County a popular tasting region. There are incredible craft breweries here as well. You can combine a wine tour with a beer tour of Prince Edward County, or stick to your favorite drink of choice. Your call! If you want to delve into the history of craft beer in Prince Edward County, look no further than Prince Eddie. 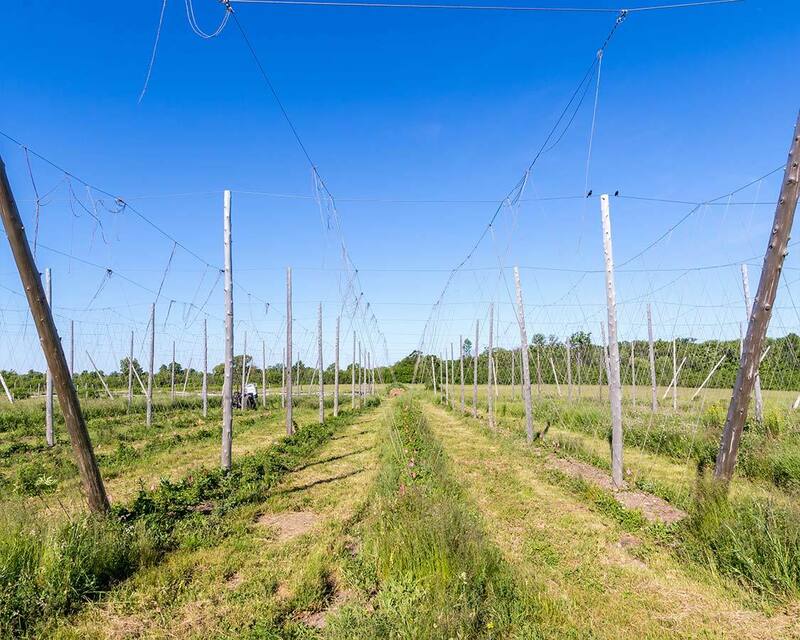 If you are a lover of hops, this Prince Edward County brewery is for you. Prince Eddie has a youthful surfer feel, but they have obviously spent some time honing their craft. Because, the beer at Prince Eddie brewery are excellent. As a bit of a metal fan, I always aim for a can of Seek and Enjoy when I’m there. You can check out all of their great local events on their website here. If you want to know my favorite brewery in Prince Edward County, it’s Lake On the Mountain Brewery. 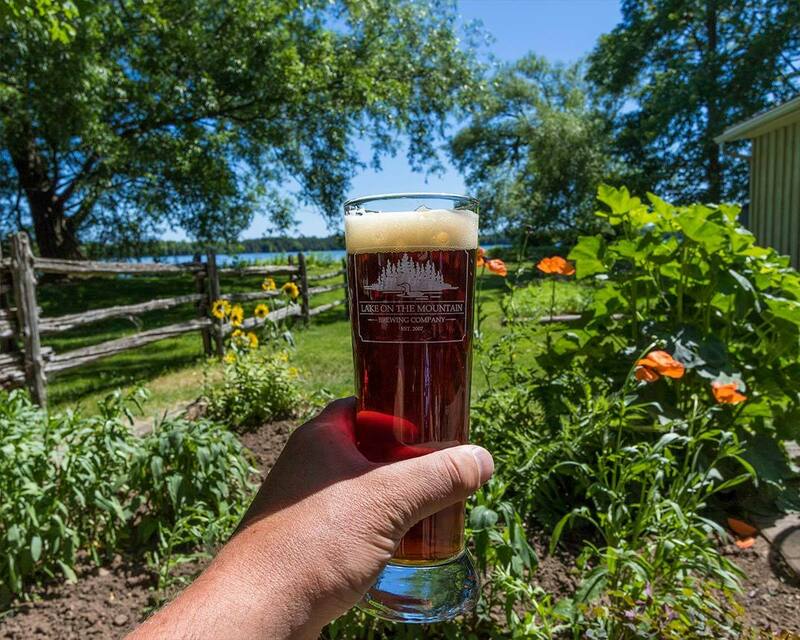 Not only do they craft excellent brews, but it’s paired with some of the best scenery in all of Prince Edward County. Kids will love the garden outside and the classic Model A car at the edge of the road. 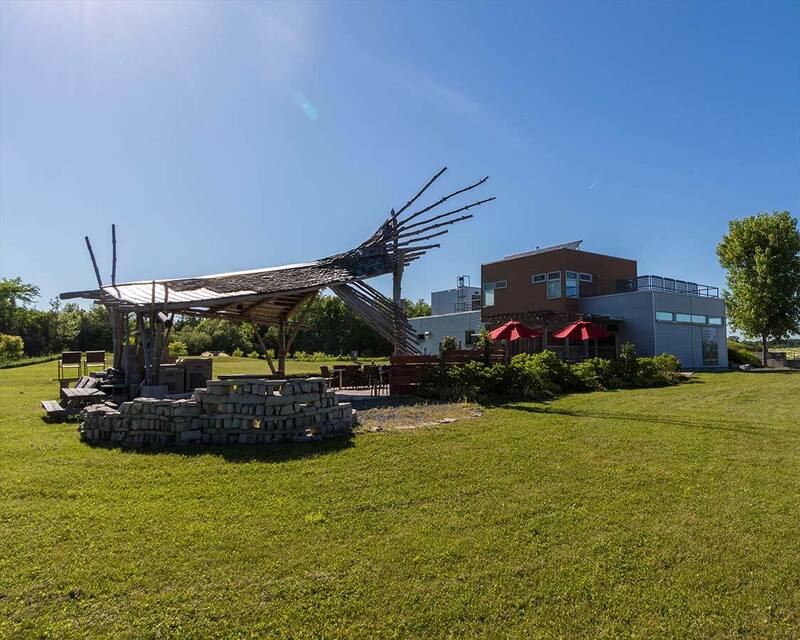 But stay for the food and enjoy the scenery at Lake on the Mountain Brewing Co.
Breweries in Prince Edward County don’t get much more central than 555 Brewing Co. This startup is right in the heart of Picton. On top of a great selection of brews, but they also have tasty wood-fired pizzas. If you love to hang out in cool, historic towns, 555 Brewing Co. is the perfect stop for you. 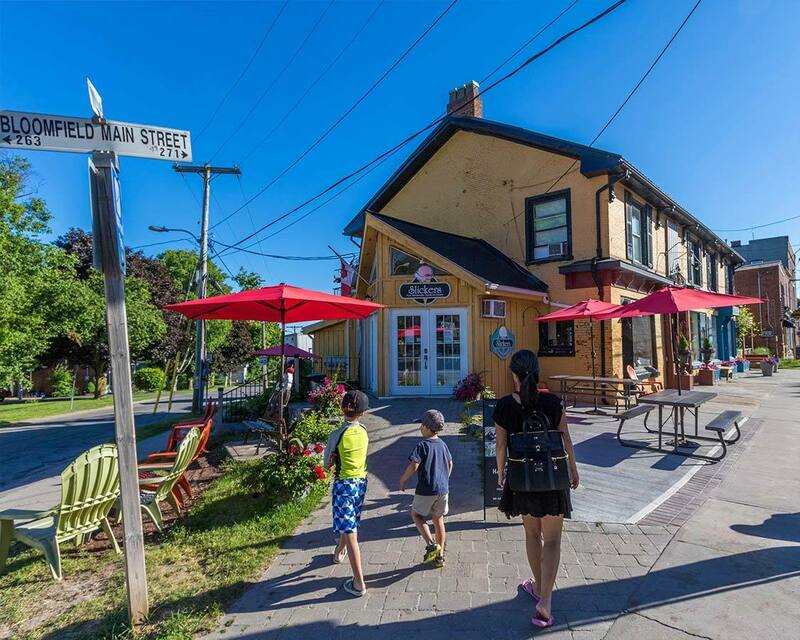 Located on the far eastern arm of the island, just past Waupoos, Fifth Town Artisan Cheese Company is one of the best-tasting things to do in Prince Edward County. Not only does Fifth Town Cheese create world-class cheese products, but it does so using an environmentally friendly Platinum LEEDs certified production facility. They also offer on-site sourced honey, juice, and fruit (depending on the season). I don’t want to know what it’s like to visit Prince Edward County Ontario and not stop for an ice cream cone at Slickers. Slickers is often hailed as one of the best ice cream places in Ontario, and some think they are even better than that. They craft their Slickers ice cream in small batches from locally sourced ingredients. Slickers also has a huge selection of flavors such as toasted, and burnt marshmallow, apple pie, and passionfruit. There are two Slickers ice cream locations. One is in Picton, while the original Slickers location is on Main St. in Bloomfield. 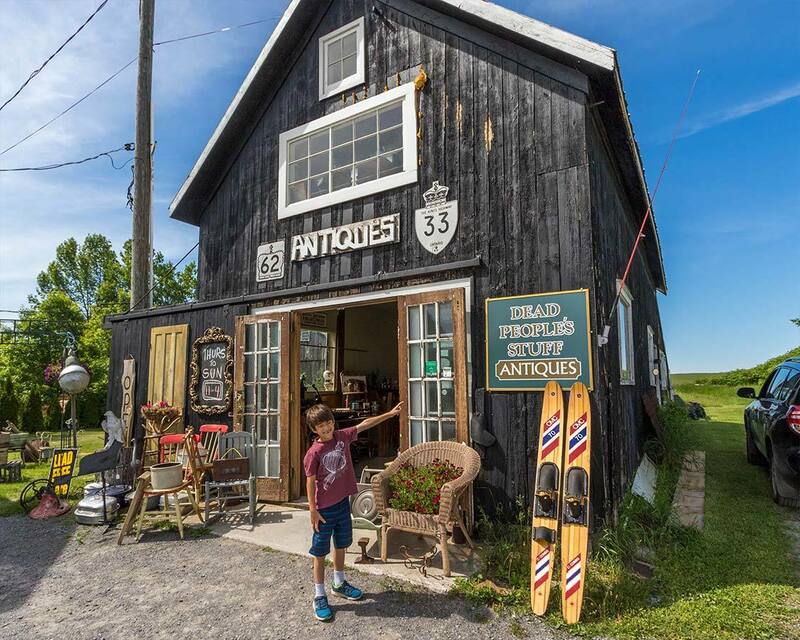 There are a lot of places to go antiquing in Prince Edward County. But, there is only one place that is blatantly obvious about where those antiques came from. And that is Dead People’s Stuff in Bloomfield. Here you can pick up pine furniture, old collectibles, and other fine antiques old enough to have belonged to those who have passed before us. If you are looking for great antiques in Prince Edward County, you should not miss Dead People’s Stuff. We spent a few nights staying at Fronterra Farm in Prince Edward County Ontario. 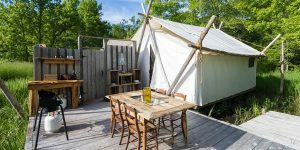 This beautiful series of frontier-style tents is just a short canoe ride from North Beach Provincial Park and is one of the most unique accommodations in Prince Edward County. 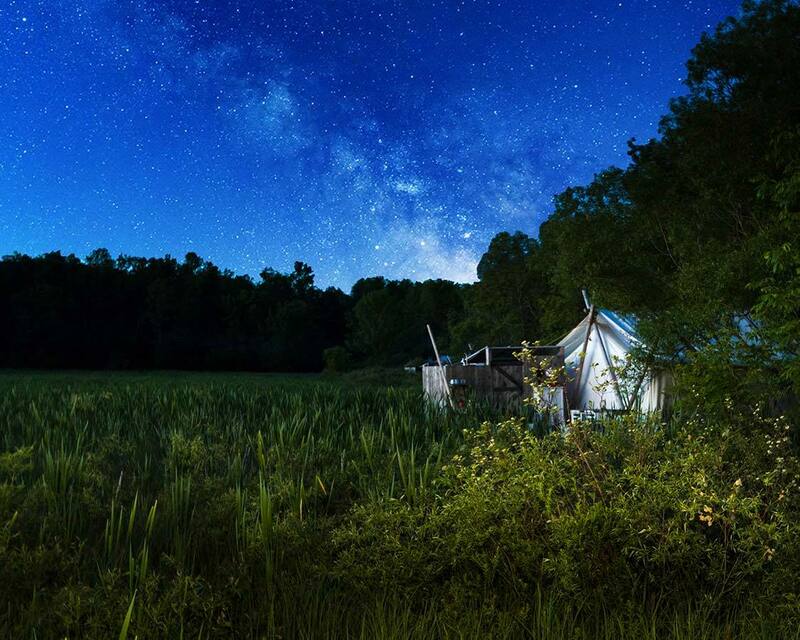 Whether you are staying up to watch the stars twinkle in the dark skies of the county, or just relaxing by a campfire and listening to the sounds of the crickets, Fronterra is one of the best places to stay in Prince Edward County. You can read all about our experience at Fronterra Farm here. The Drake Devonshire is a local icon in the town of Wellington. 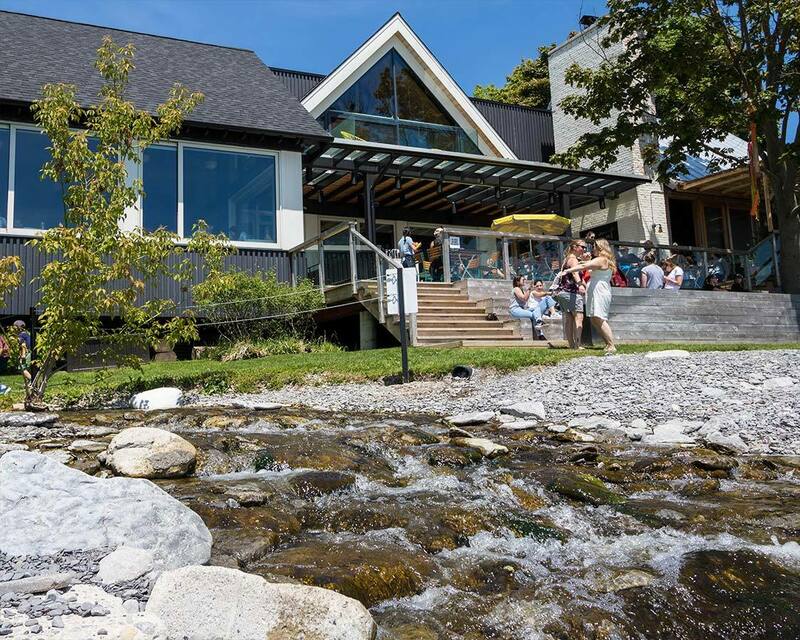 Not only is the attached Drake Devonshire hotel ranked among the best places to stay in Prince Edward County, but the restaurant is a local and tourist icon. There are equal parts hipsters looking for the best Instagram shots, families grabbing a meal on the beautiful lakeside patio, and senior’s deep in conversation by the fire in the library. The Drake Devonshire is a 13-Room boutique hotel and restaurant built on one of the most beautiful pieces of Lake Ontario shoreline. The grounds are bordered by a quiet creek, art installations, a fire pit, and everything that screams Canada in a nutshell. The multi-tiered patio is the ideal spot to grab lunch on a sunny day. I highly recommend trying the chicken and waffles. If you are looking for great Prince Edward County accommodations, you have a lot of options. For glamping, you can’t go wrong with Fronterra Farm. 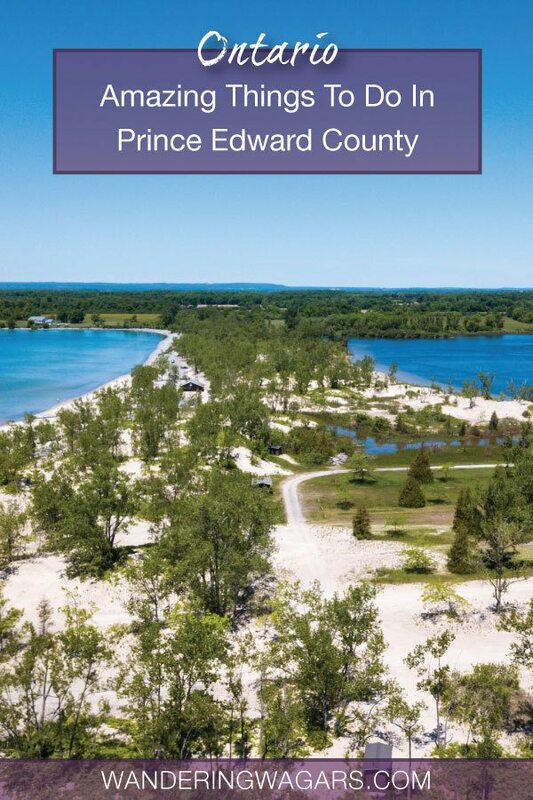 If it’s Prince Edward County camping you’re looking for, try to get a spot at Sandbanks Provincial Park. But if you are looking for the best Prince Edward County hotels, The Drake Devonshire is definitely among our top suggestions. But the Drake can book up quickly, so here are a few other Prince Edward County hotels for you to check out. It’s worth noting that accommodations in Prince Edward County can book up quickly. It’s always a good idea to book early. It would be a shame to miss out on all of the beautiful things to do in in Prince Edward County. If you are looking at staying in the postcard-perfect town of Picton, Ontario, then the Waring House is a great place to consider This charming hotel is popular for weddings and parties. Enjoy the atmosphere of the 19th century stone farmhouse or dine at the on-site Barley Room Pub to make the most of your experience. You can check out the prices and availability of the Waring House on booking.com here. 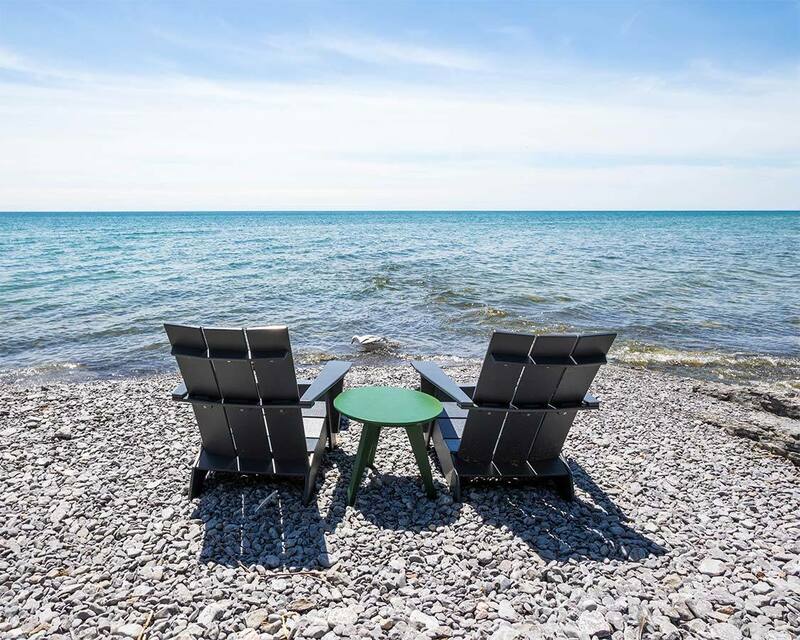 If you’re looking for great Prince Edward County cottage rentals and hotel rooms, Isaiah Tubbs Resort on the shores of West Lake is definitely worth checking out. You can take advantage of the supplied canoes and kayaks to explore West lake or enjoy the nearby wineries. Families will love the outdoor pool during the summer. You can check out their prices and availability on booking.com here. 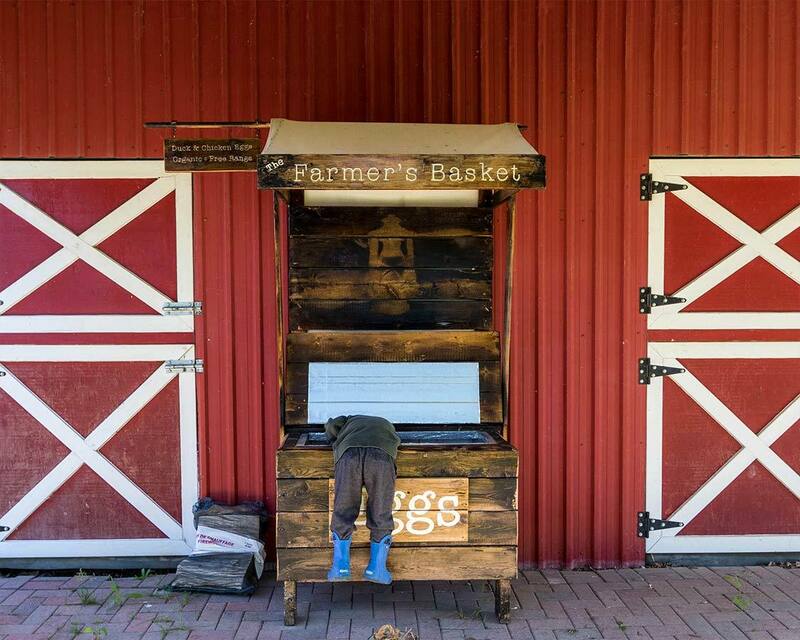 Exploring Prince Edward County with kids is just as fun as visiting PEC as a couple or on a tour. The parks and farms are wonderful places for kids in Prince Edward County to run and play. Even most of the PEC wineries and breweries are kid friendly. Waupoos, for example, has a large yard, great views, and even a candy shop for little ones (although the candy shop is great for adults as well!). The Prince Edward County beaches are excellent as well. There are miles of sand dunes, shallows, and rivers to visit. And everywhere in PEC, there are birds filling the sky and putting on a show with their acrobatics. We think visiting Prince Edward County for families is tremendous, and its something that we do nearly every year. 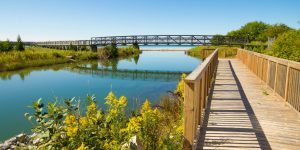 Unless you are staying local in some of the main Prince Edward County communities, it is best to explore PEC either by car or for the more fitness-focused, by bicycle. There are local tours that explore some of the Taste Trail, Arts Trail, and wineries in Prince Edward County. These tours tend to start from the major towns of Picton, Wellington, and Bloomfield. If you are staying in one location and trying to see as much of PEC as possible, I recommend spending at least a long-weekend in Prince Edward County. If you only have a weekend in Prince Edward County you may want to consider staying one night in the Picton area and one night near Bloomfield in order to maximize your PEC experiences and minimize the amount of time you’ll spend driving. Have you made the trip to Prince Edward County Ontario? Tell us about your experiences in the comments below. Or, head over to our Facebook page and share a photo of your trip. We would love to share in your journey. 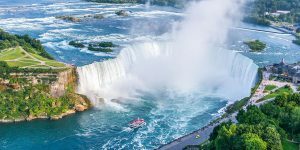 Exploring Niagara Falls: Which Side Is Better? I couldn’t agree more. That’s why we keep coming back! Kevin, what an excellent article for such a unique, beautiful area! We honeymooned at Lake on the Mountain 17 years ago and have stayed in the same room every anniversary since. Mid June. 2 weeks. Have made so many good friends in County and our ‘Favourites Wineries’ list has much expanded over the years. Of course, there were only 3 open tasting rooms when we first visited. The breweries are a big hit as well. Of course, like you, Ryan’s is my favourite! Cheers from Kitchener and will keep an eye out at Sandbanks, 3 Dog, Grange, Huffs, oh who am I kidding? Anywhere there’s a patio, for you. Thanks Dave! I love your attitude! Anywhere there’s a patio and you can enjoy those beautiful PEC summers. I know exactly why you keep going back. 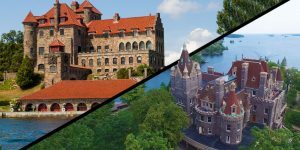 Every year there is something new and exciting to discover in the County! What a great way to introduce children to the arts! You are so right! There is such an incredible art scene in the County. You are correct! Thank you so much for the fact check. I’ve updated the article accordingly. Thanks for the input Marie, I’ve updated to clarify references from those inside the County and those outside. My husband and I both agree that so many amazing restaurants get over looked in most articles about The County. Blumen Garden Bistro, Hartleys, Portabella and Stella’s Eatery just to name a few. Those who live in PEC know where the best food and service is. It’s a shame most of them are rarely mentioned and the one that has a revolving door of staff, mediocre food and a dining room that resembles a cafeteria (regardless of the view) is. I love it when awesome restaurants and destinations get a shout out and I hope to try these places when I’m back in PEC. Thanks for including Dead People’s Stuff Kevin! Please come back again! Thanks for showing us a good time while we were there. My son had a blast exploring all of the amazing antiques and collectibles. Thanks for the great article on our beautiful County. Some great spots on Closson Road, The Old Third winery, Shed Alpaca Farm, Brokenstone winery, Gravil Hill winery, Closson Chase winery, Closson Road Cycles, The Lavender Farm, Lacey Estates Winery, The Grange of Prince Edward and Hinterland Winery. A few B & B’s on the road as well. It’s one stop shopping driving down Closson Road. Thanks so much Liz! It’s great to hear of so many amazing places. They give me ample reason to head back and explore some more.